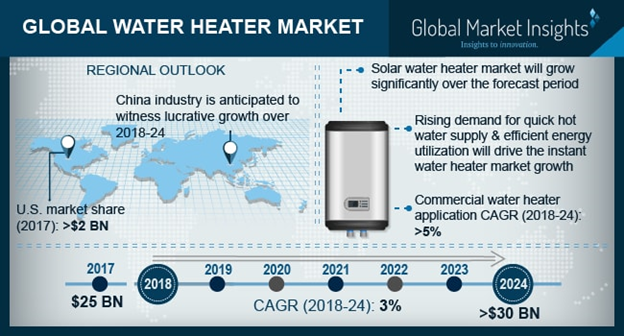 Global Water Heater Market size will surpass USD 30 Billion by 2024, as reported in the latest study by Global Market Insights, Inc. Stringent government regulations to limit carbon emissions along with the increasing penetration of advanced water heating technologies will drive the global market. Growing consumer inclination toward the adoption of energy efficient systems owing to their operational benefits will stimulate the product demand. As per the Ecodesign Directive 2009/125/EC, all the energy-related products across EU member states should be mandated with ecological requirements. This directive currently covers over 40 product groups and aims at reducing energy use and mitigate the environmental impact under its scope. U.S. market was valued over USD 2 billion in 2017. Increasing adoption of natural gas owing to limited carbon footprint when compared to coal & other fossil fuels will stimulate the industry growth. In addition, augmented supply together with reduced consumer prices have encouraged natural gas consumption that will fuel the product demand. For instance, according to U.S. Energy Information Association, in 2018, the overall natural gas consumption in the lower 48 states increased up to 11% and the total supply raised up to 10% when compared with 2017. Increasing infrastructure development coupled with an upsurge in urbanization rate across the emerging economies will positively influence the market. In addition, growing focus toward the implementation of green growth strategies along with expansion of residential establishments will complement the product adoption. According to UN’ “Department of Economic and Social Affairs”, in 2018, around 55% of the global population dwelled in urban settlements and it is anticipated to increase upto 68% by 2050.